Lexus has upped their game in recent years and I for one completely agree with the direction they are taking. Their latest designs for their entire range I have really liked, they have taken a leap out of their comfort zone with bold design and style. 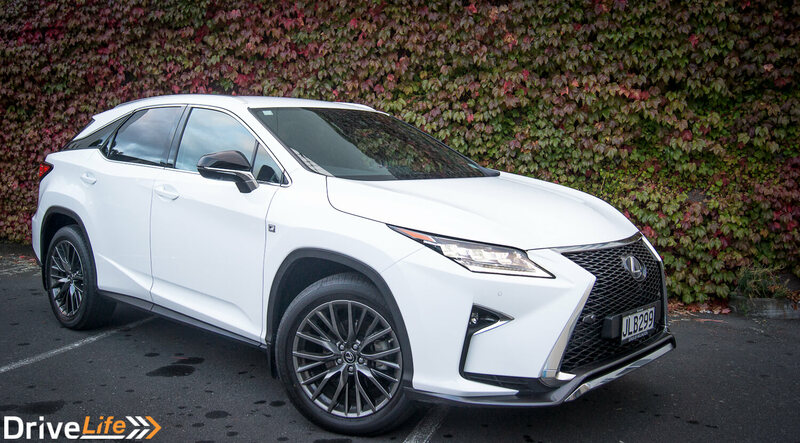 The Lexus RX 350 F-Sport is yet another model from Lexus that just looks stunning. When I first saw the RX350 as I picked it up I immediately thought I was going to like this car. 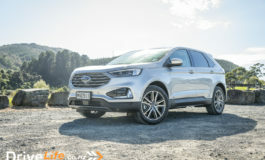 Its design is all angles, stemming from the now well-known hourglass grill right back to the rear where that same design was resembled on the boot, although not as prominent. The best colour this car could have come in is white in my opinion (although also available in silver, grey, black, red and blue) as it just accentuates every angle and really highlights the details of the car. When driving you knew it was something special as it stood out from the crowd and got a lot of looks from other motorists, and pedestrians when stopped at lights. This is where we get to the good stuff. 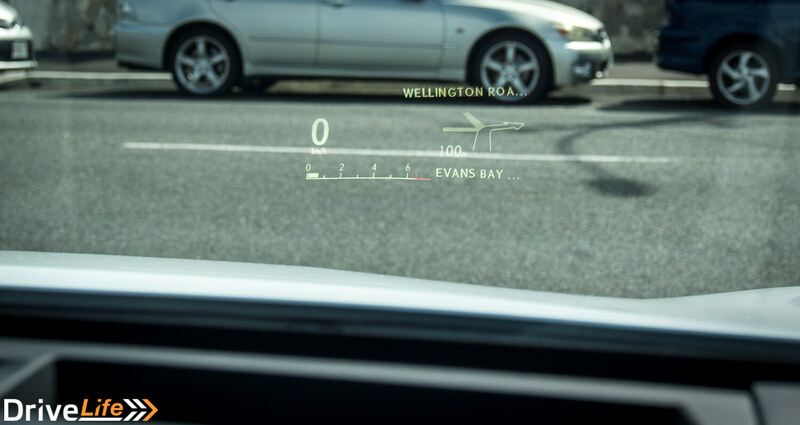 Inside your eye is first drawn to the 14-inch widescreen display in the center dash. This is a great feature, and the extra room is used in several ways. Normal driving it is split 70:30 showing you a large map/nav on the left with quick menu items on the right. In the quick menu you can have a second map that is zoomed in a lot closer so you can easily see streets in better detail and also be able to see your route navigation if it was on. 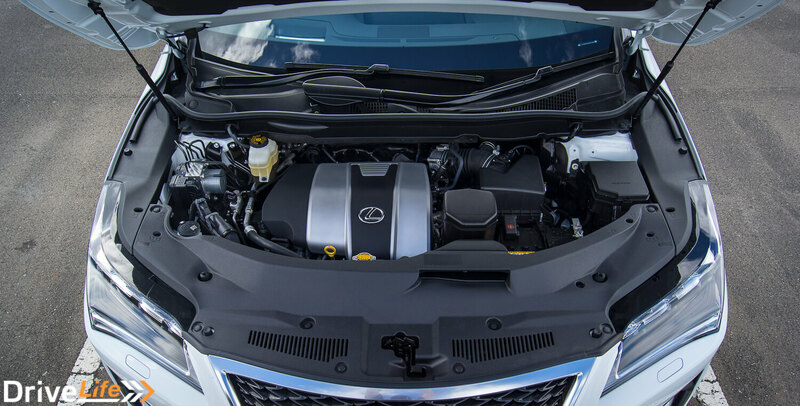 You also have radio/music, quick contacts, fuel consumption graph and then a/c settings and controls. If you put the car in reverse the screen would not only show you the reversing camera but also the 360 degree view camera to the left of it, which made parking this not-so-small car a breeze, even in the tiniest of spaces. You could also turn the 360 camera on while moving forward at slow speed to be able to maneuver around obstacles in tight spaces. 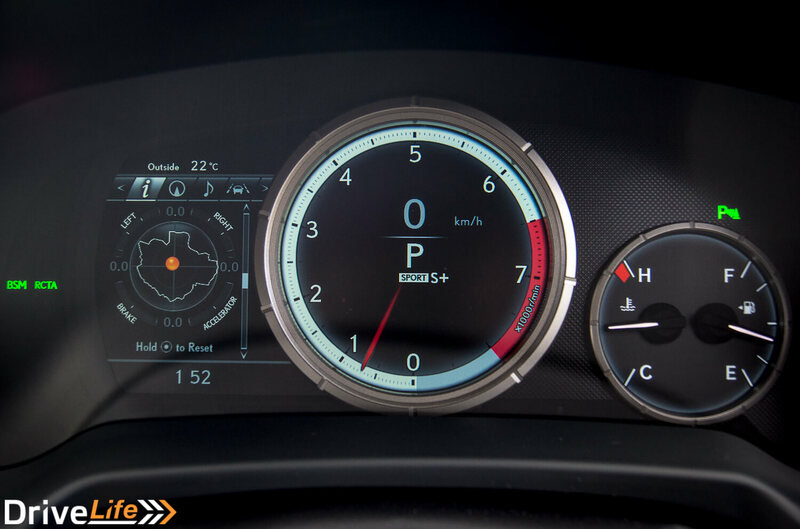 The instrument cluster is another Lexus great, a digital display. A large center round screen to show the tachometer with speed shown in the middle. 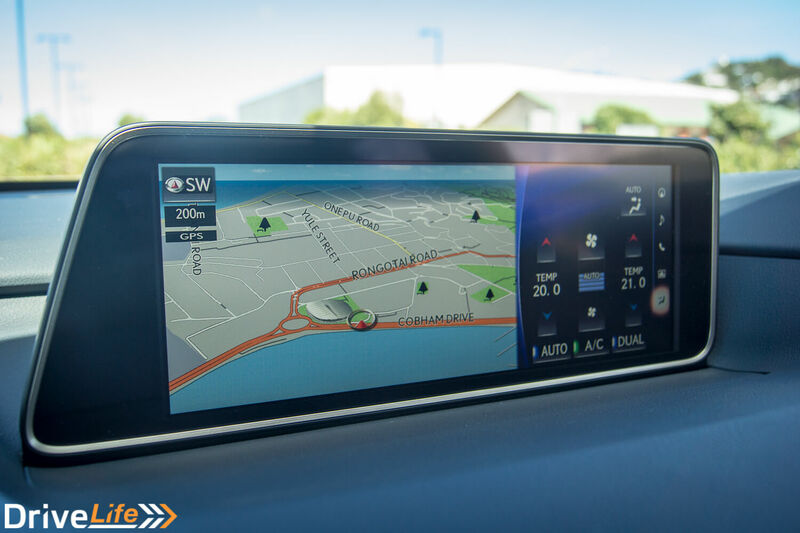 Two analogue dials to the right to show fuel and engine temperatures and a second screen to the left that could show you an array of information including (trip information, fuel economy, g-meter, sway meter, tire pressure, power distribution). Although not new technology it was a new experience for me to have a H.U.D ( or heads up display). I now feel like I should not have had it as I want one in my own car, it was so handy to have. It took me some time to get used to and I still looked down to the instrument cluster to check my speed when it was floating right in front of me. I only had to move my gaze from the road down about 2 inches and adjust my focus to see it. This particular one was full color although mainly showing white it would show the the reverse gear in red if selected and would also display your next step in your route in color if you had one set. 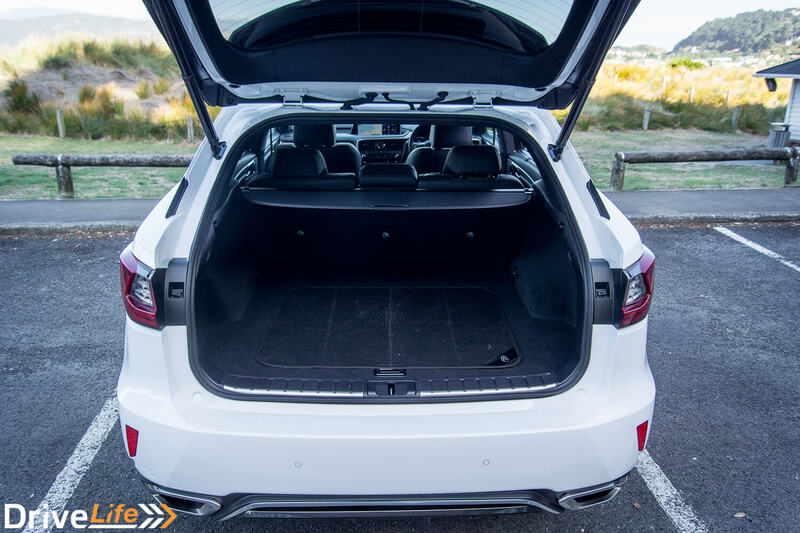 The car had heaps of storage too with a large boot and powered rear door, it was able to carry the weekly shop, my backpack and camera gear with room to spare. 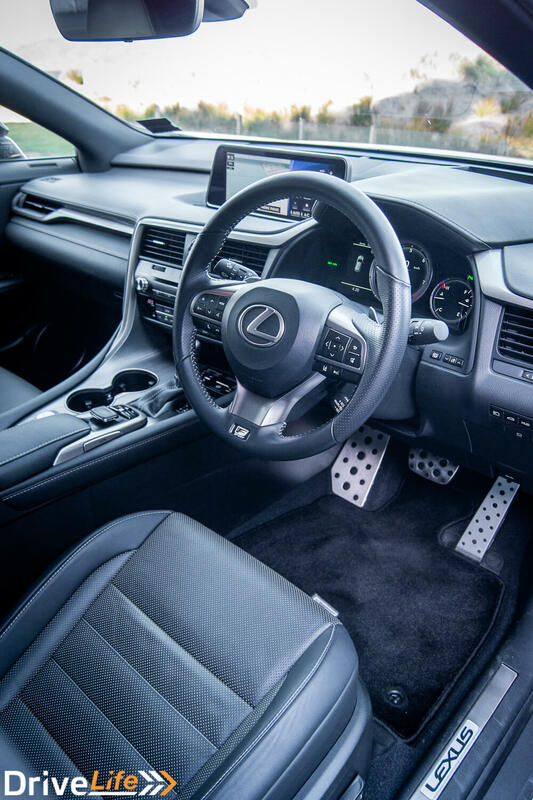 A new feature for the 350 was the automatic boot open feature, all you had to do was hold your hand in front of the Lexus logo on the boot and it would unlock and open assuming you have the key in your pocket. I did not find this to be a great feature as I found it to be a little temperamental, not always working and having to make sure the key was in the pocket closest to the car or twist myself to make it be the case. I also found it to be not that helpful, I could not really use it if I was carrying something as my hands were not really free to hold in front of the logo and the logo was higher than the button that opened it and I found it just easier to push the button. It would have been better to have some kind of foot/leg sensor like other brands have. 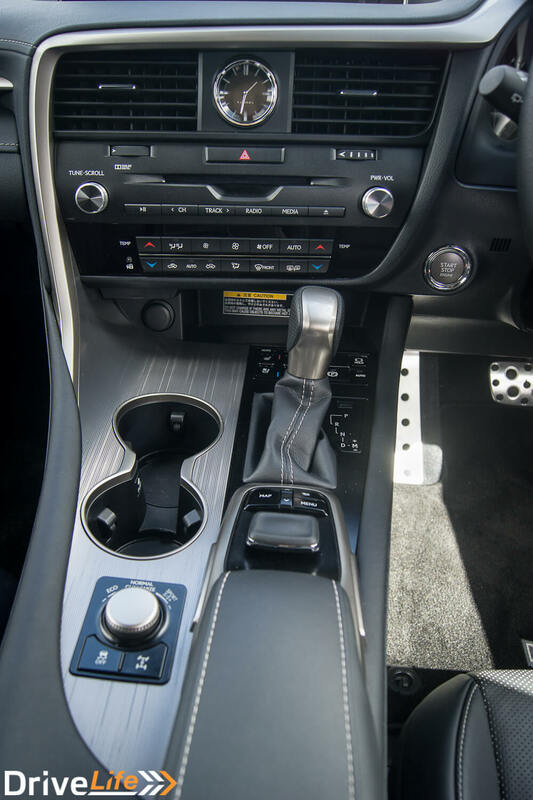 This being the 3.5 litre F-Sport model, let’s get away from the interior and see how it drives. 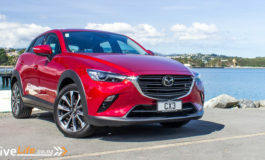 I was a bit surprised by the handling of the RX 350 I thought it would feel big and cumbersome to drive around the small streets of Wellington but it feels as small as a standard saloon car to maneuver. The steering felt nice, it was light when needed in carparks or while doing small maneuvers but felt more weighted once you had a bit of speed, always feeling like you were in control. The seats were great too, comfy enough that I felt I could drive for days and get out still feeling comfortable and relaxed yet stiff enough to hold you place during any spirited driving as helping to hold you in the seats with sufficient side bolstering to make you feel like you were going nowhere. 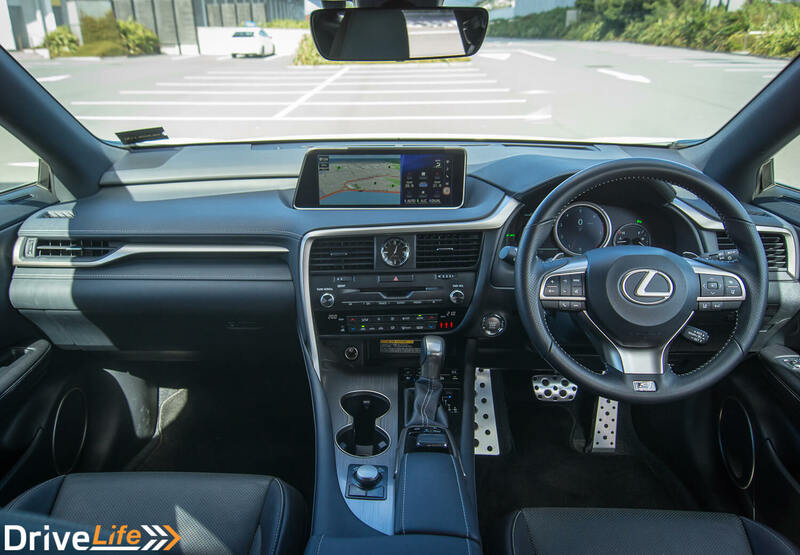 The RX350 like most other Lexus’ now had 5 different driving modes to choose from, normal, eco, sport, sport + and custom. Custom could be configured to what you would like the car to do. 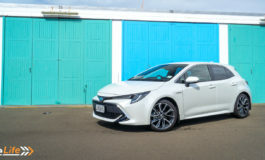 For example you could have the engine in sport+ mode making it more aggressive with faster throttle control and holding gears into higher revs, but then select to have the suspension very soft so it was not too harsh. One thing I would worry about with this car and its vast array of technology is that it might make you a bit if a lazy driver. Once on the motorway leaving the city I set the adaptive cruise control and let it take over. I was able to drive all the way to upper hutt before I needed to touch the pedals again. As traffic would slow in front of me the car would slow down to match it and speed up again if the path cleared to the speed I had set. It would even go all the way down to a full stop when I was behind someone as we came up to stop lights, only requiring a tap of the cruise control stalk to confirm it was safe to move off again and it brought me all the way back up to speed again. Add to this the lane departure warning system, automatic wipers and automatic headlights with automatic high beam there was very little for me to do, I was always keeping a lookout in case something happened that it did not notice but I could see how you could easily become very trusting of it if you lived with it on a daily basis. Great design, challenging the norm. 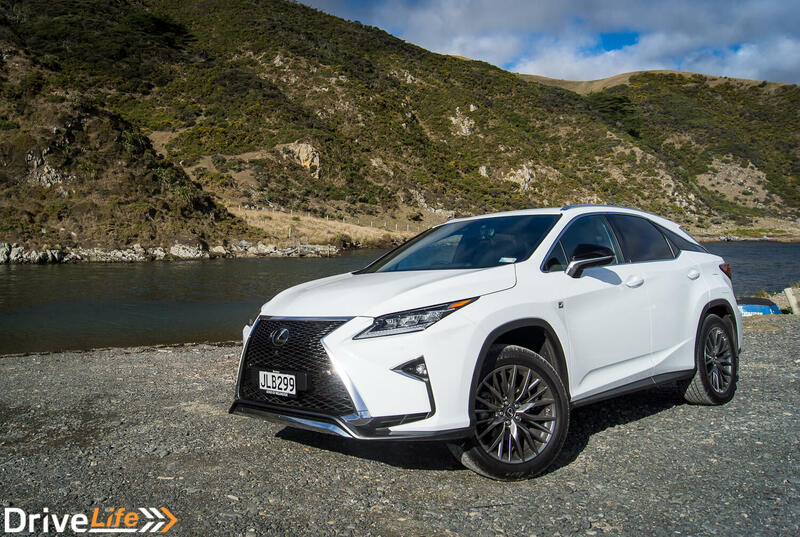 It is hard to fault the Lexus RX350 f sport and I was really having to think about aspects of the car that I felt were wrong, and even at that I was just not picking at minor annoyances than faults. 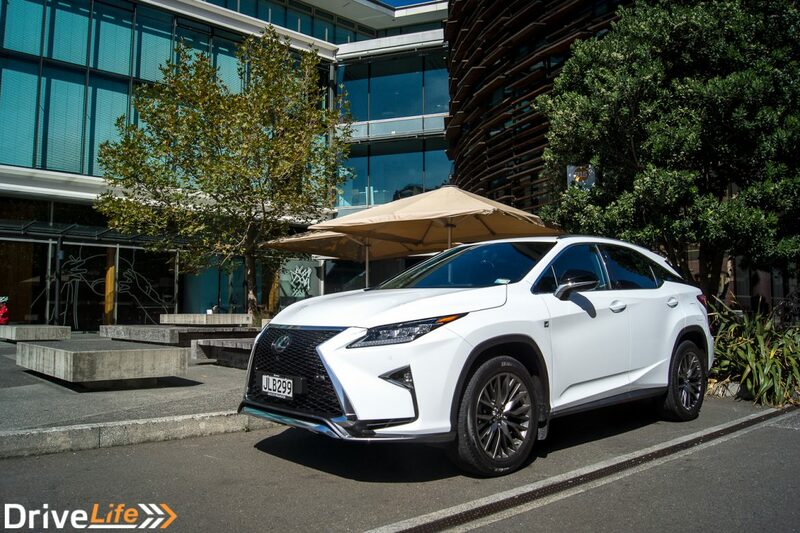 Overall another great example of Lexus’ great cars and I for one look forward to seeing what the future brings as they push the boundaries even further.